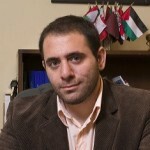 Yousef Munayyer is a Palestinian American writer and political analyst based in Washington, DC. Munayyer was born in Lod, Israel. He is currently the Executive Director of the The Jerusalem Fund for Education and Community Development and its educational program, the Palestine Center. Previously, Munayyer was a policy analyst with the American-Arab Anti-Discrimination Committee. He holds both US and Israeli citizenship.